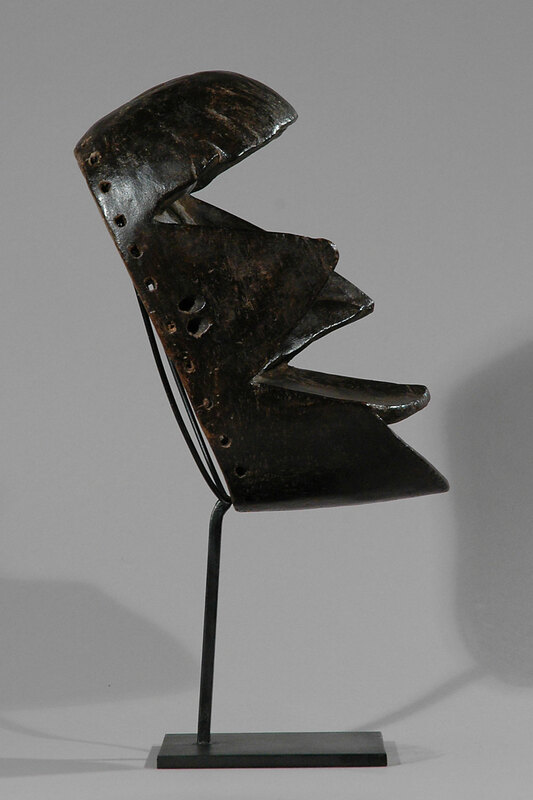 This is an interesting, extremely angular, old ‘cubistic’ chimpanzee mask, called ‘kaogle’ or ‘kagle’. 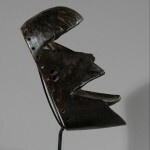 It was used with large costumes during important feasts of the Dan-Guere (also Wè or Dan-Kran) in order to challenge and ‘galvanise’ the audience with earthy jokes and jumps. 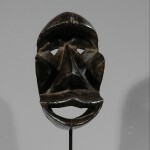 This mask is an especially beautiful example of the ‘kaogle’ or ‘kagle’ type: The semicircular, bulging forehead above the deep-set, triangle eyes protrudes remarkably, as are also the angular cheeks and triangular-shaped nose. Under the nose, the chimpanzee’s round mouth even more. 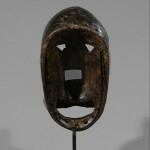 The surface of the mask is consistent with substantial age and extensive use. 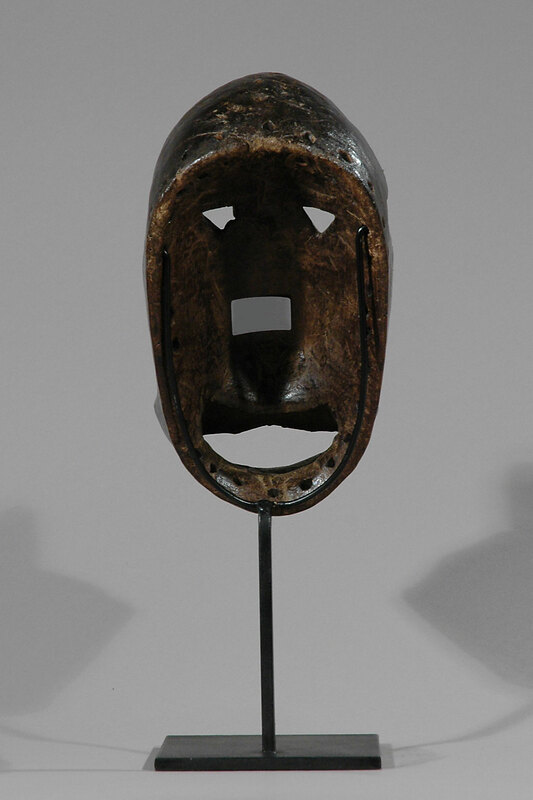 This extraordinary piece displays a very good shiny patina at the edges and the surfaces as a result of extensive use of the mask. The patina on the back confirms this impression. 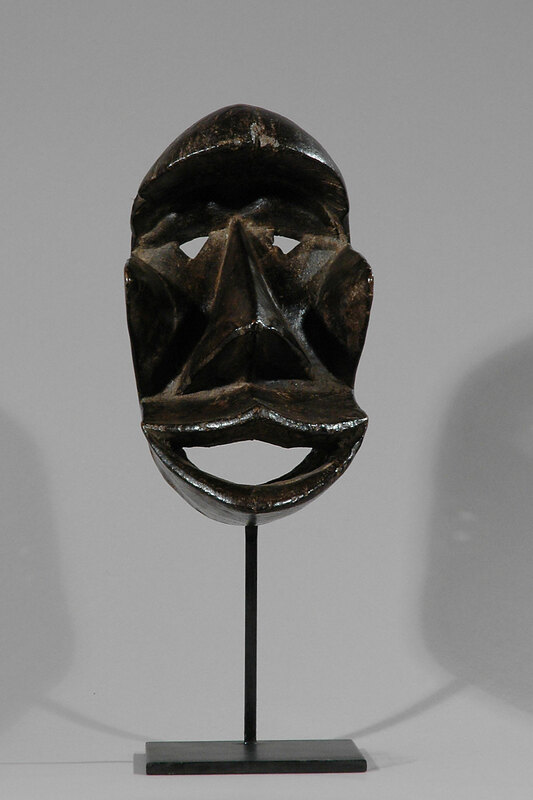 Famous for their masks, the Wee as well as other people in Liberia, including their neighbors the Dan believes that spirits, known as “Du,” live in the forests and manifest themselves to humans in masks and masquerades, instructing and sustaining individuals in life. 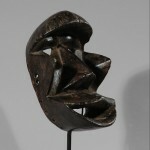 When during a dream a male was instructed by Du to dance a mask, he would commission a carver to make a mask for him. Age: Est late 19th C. to first third of the 20th C.
Provenance: From a private Belgian collection. Collected in situ before the 1950s. Literature: G. Schwab: “Tribes of the Liberian Hinterland,” ed. 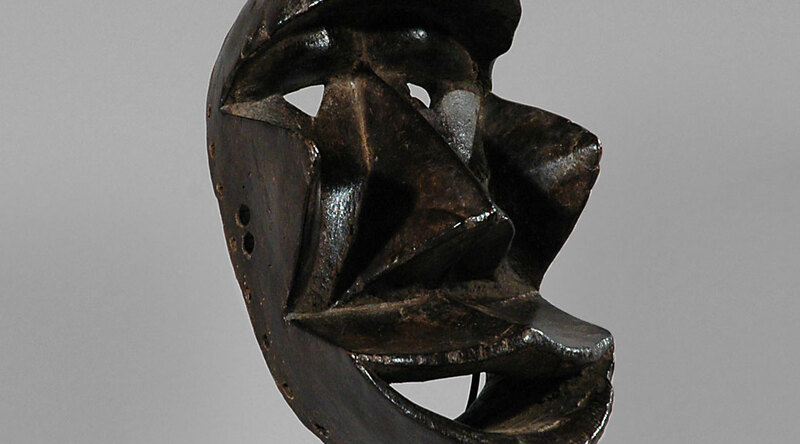 G. W. Harley, Papers Peabody Museum, Archaeology & Ethnology, xxxi (Cambridge, MA, 1947) W. Siegmann and Cynthia Schmidt, “Rock of the Ancestors,” (Suacoco, 1977) E. Fischer and Hans Himmelheber: “The Arts of the Dan in West Africa,” (Zurich, 1984) E. Fischer Dan Forest Spirits: Masks in Dan Villages, African Arts, II, no. 2, 1978. pp. 16-23, 94 B. C. Johnson: “Four Dan Sculptors: Continuity and Change,” (San Francisco, 1986) I have examined this piece and agree with the description. Niangi Batulukisi, PhD. 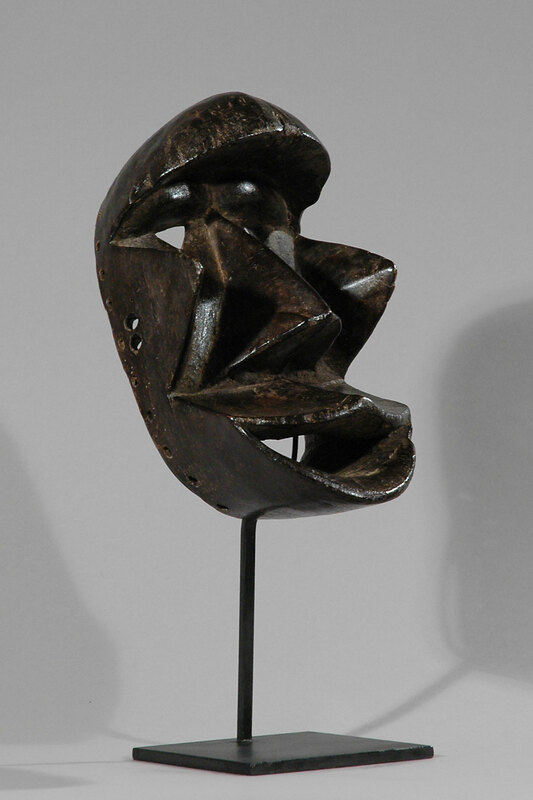 – Fischer & Himmelheber, Rietberg Museum Zurich, ‘Die Kunst der Dan’ by ill. 78, 80, 82, 84; ‘African Art in American Collections’ by Robbins & Nooter, ill. 327; ‘The Tribal Arts of Africa’ by Jean-Baptiste Bacquart, p. 36, ill. 7.